This has to be one of our favorite places we have ever stayed. Not only is it beautifully decorated, but Ed is a fabulous cook! Food is one of the top things we look for in a bed & breakfast after the other important things. 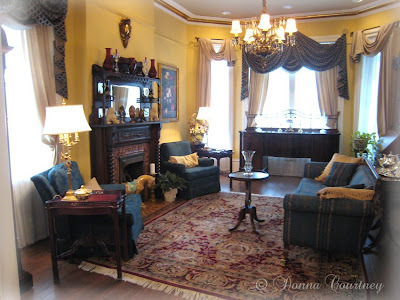 We only began staying at Bed & Breakfast a few years ago after hearing good reports from friends like Rhoda. This particular one was rated high on tripadvisor and an ol' internet friend Deb had stayed there, too. There is no parking except in front of the these old houses. But that didn't seem to a problem. And the fire station is directly across the street. That made me want to run. But we never heard a siren of any kind in the 3 days were in Savannah. The owners have a fantastic collection of art and antiques. 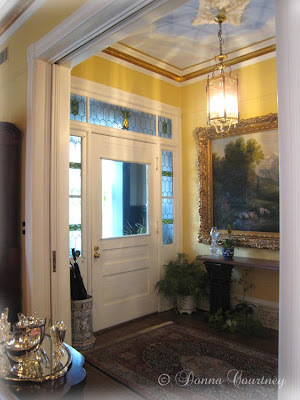 This is the foyer. Beautiful , comfortable area for sitting and relaxing & wine and cheese in the evening. Every morning Ed has this table set so beautifully with old china and crystal. As lovely as it is, the food still stands out as the best thing to check out! You can visit their website here. 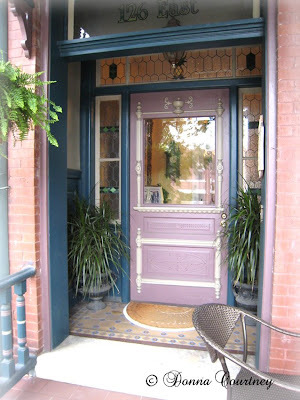 1895 Inn, Bed & Breakfast. "The Sovereign Room, at the top, front of the house, has a large arched window with a view of the spires of the Cathedral of St. John the Baptist. A massive four-poster canopy bed welcomes you to this terra-cotta colored room with rich gold and cream fabrics. An oriental carpet is framed by the original heart-pine floors; and antique oriental water colors, Japanese wood-block prints, and Japanese scrolls from Kyoto cover the walls. The Sovereign Room - with its luxurious bathroom with extra-long soaking tub." It has the largest bathroom in the house! I'm looking through pictures that might be of interest to you all. Savannah. Oh, some day...for sure. I am lost in this post right now. I think I remember seeing that one, Donna! It's been way too long since I've been in Savannah. I hope this means you're going for another trip. Can't wait to hear about this one! What a beautiful place...I would love to visit the south again. It seems so romantic. It really looks like a fairytale sort of place. Good choice! What a beautiful place! 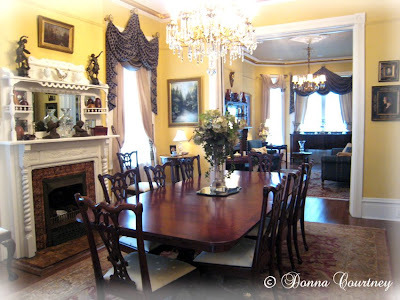 I love the mantel and the big chandelier. I so agree with your sentiments on Savannah sweet one - I miss that place as soon as I leave it... it stays with you - you know? So beautiful in a haunting way almost. Love, love, love Savannah. What a delightful place this is - maybe one day my hubby and I can stay there too!